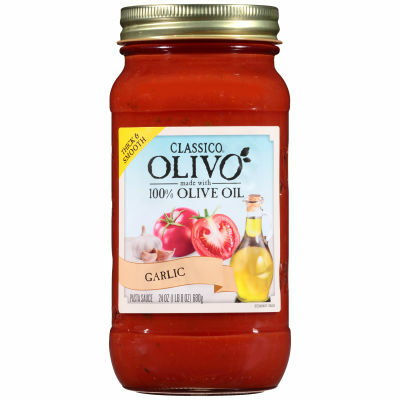 Classico Olivo Roasted Garlic Pasta SauceClassico combines three rich strong flavors of diced tomatoes dipped in tomato juice, dried roasted garlic and fresh basil, these ingredients gives a whole new exciting exotic taste to this sauce and make more rich and delicious Pasta of all time. Simple but FlavorfulThis Classico Olivo Roasted Garlic Pasta sauce with strong taste of garlic goes perfectly with your all favorite Pasta. Just boil pasta and simmered in this flavorful Classico Olivo Roasted Garlic Pasta Sauce and it will make your pasta heavenly delicious with true flavor dried garlic and basil. Serving size 1/2 cup (125g).